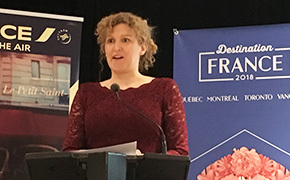 Atout France was in town last week, hosting its annual Destination France roadshow, which featured four stops – Quebec, Montreal, Toronto and Vancouver. 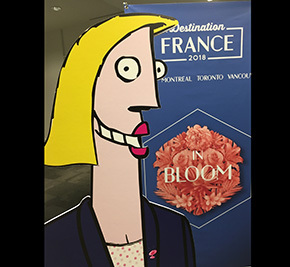 The theme this year was ‘In Bloom,’ which took on a dual meaning of sorts – on the one hand, there was a focus on the many gardens tourists can visit while in France, while on the other it commented on the current status of France itself as it continues to bounce back from the 2015 attacks in Paris. While international arrivals from other key markets were down, resulting in a decrease in tourism globally for France in 2016, for 2017 the destination was back on track, Paul-Hus said. France is looking to capitalize on this forward momentum, setting ambitious tourism targets: 100 million international tourists by 2020 and €50 billion spent by visitors. 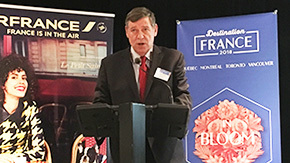 Also at the event, Air France-KLM’s Director of Business Development for Canada, Pieter de Man, took the opportunity to highlight the company’s revamped Flying Blue loyalty program, which will take effect on 1APR. Described as “a more simple and flexible program,” it is based on spend and one’s level within the program, instead of distance travelled, and also offers reciprocal benefits to those who collect and redeem miles through WestJet’s (an Air France-KLM partner) reward program. The event ended with a cocktail party and a couple of awards given out. The ‘Product of the Year’ award went to Globus for its ‘Paris, Normandy and the Loire’ tour and the ‘Partner of the Year’ award went to TravelBrands, recognizing its active participation in promoting France.